Make a bold statement with the Pax Series, featuring an assortment of heavy-duty stainless steel sinks engineered to meet your everyday needs with superior style. We've expanded our collection of best-selling kitchen sinks to include a contemporary commercial-style series of restaurant-quality basins in a range of sizes. The Pax Zero-Radius 28 1/2 Inch Kitchen Sink has a clean, geometric design, with precise zero-radius corners for a distinctively modern look. This sink is handcrafted from premium T-304 stainless steel, an extra-tough material that is highly valued in the restaurant industry for its sturdiness and durability. The machine-finished satin surface has a neutral color that matches most stainless steel appliances, making this sink at home in any kitchen. The flawless finish provides additional protection against stains and rust, and will not dull or chip from daily use. Gently sloped 95° walls reduce splashing and make cleaning & maintenance easy. Channel grooves along the bottom of the sink are engineered for optimal drainage. The generous 10""-deep basin easily accommodates even the largest pots and pans, making this the perfect sink for a variety of kitchen tasks. A square rear-set drain adds to the contemporary style, and provides more usable surface area in the sink. All Pax stainless steel sinks are amply padded on every side with our proprietary NoiseDefend sound dampening system. Protective undercoating is used to further reduce noise and prevent condensation buildup in the base cabinet. 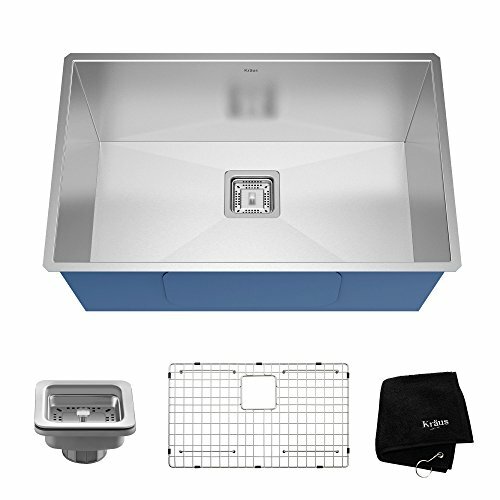 This feature is an extension of the proven soundproofing technology seen in our best-selling basins, and offers superior noise reduction for a quieter kitchen environment. The Pax Series has a range of basin sizes that allow you to create a kitchen workstation with flexible functionality, matching the way you work. To outfit a larger kitchen in seamless style, pair this model with a bar/prep basin from the Pax Series. All Kraus stainless steel sinks require minimal maintenance, and are protected by a Limited Lifetime Warranty to ensure lasting satisfaction. Coordinating accessories are included with purchase, ensuring the perfect fit for your sink in both size and style. The top-quality strainer keeps food and debris from clogging the drain, while the premium stainless steel bottom grid elevates dishes to protect the sink against damage from daily use. A square garbage disposal adapter is available for purchase (sold separately). Build a better kitchen with the Pax Zero-Radius Series, and experience Kraus Quality with cutting-edge style. Drain opening: 3.5"" x 3.5""